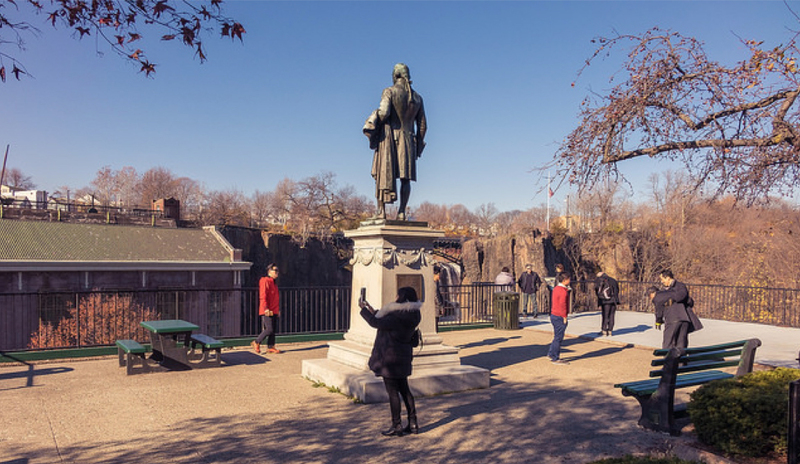 PATERSON, N.J. – On July 10, 1778, while traveling with Gen. George Washington during the Revolutionary War, Alexander Hamilton first laid eyes on Paterson’s Great Falls. Hamilton, soon to be the first U.S. Secretary of Treasury, had an idea of how the Great Falls could become the centerpiece of America’s first industrialized cities. Located on the Passaic River, the Great Falls tower 77 feet high and stretch 260 feet wide, pouring two billion gallons of water down into a canyon everyday. This natural beauty is the second most powerful waterfall east of the Mississippi River, trailing only Niagara Falls. Click on the video to view an audio slideshow prepared and narrated by writer John Rioux about Paterson Great Falls National Historical Park. The Great Falls came into existence about 13,000 years ago, during the time of the Ice Age. Retreating glaciers broke apart and through it the Passaic River began along a new course, forming the Great Falls. The area around the falls was first home to the Lenni-Lenape Indians. The tribe was drawn toward the area as the significant amount of land surrounding water was vital for the tribes fishing pursuits. The Great Falls themselves also held spiritual value, as the rock formed what looked like faces, lending credence to the idea that spirits were among them. After the Revolutionary War however, these Indians were displaced from their home. In hopes of severing the United States’ economic dependency from the British after the war, Hamilton developed the first industrialized American city in Paterson based around the Great Falls. His corporation, the Society for Useful Manufactures, designed canals, raceways and spillways reliant on power from the Great Falls to help drive newly built factories and establish an independent United States economy. Hamilton was successful in his plan, turning Paterson into the “Silk City” with more than 100 factories employing thousands of laborers. The hydroelectric plant located directly next to the falls continues to provide renewable energy to thousands of homes. Many of Hamilton’s initial developments are still around today. When one walks around the park, structures such as original mills and the water raceway are still in tact. Despite the fact that this historical landmark played an enormous role in developing the United States into an industrial power, the City of Paterson fell on hard times throughout the 20th Century, leading to a disregard for the preservation of the site. With the aid and push from many residents in the area, President Obama signed the Paterson Great Falls National Historical Act on March 30, 2009. Even with the designation as a national park, very few around the area are familiar with the historic site. Growing up in Northern New Jersey, I had never heard of the Great Falls through all my years of schooling. The Passaic River Great Falls create a scenic view for visitors (Photos courtesy of the National Park Service). It is a problem the park has been dealing with, according to Park Ranger David Buckley. “Being a postindustrial city, Paterson has dealt with problems such as unemployment and drugs, leaving the falls as a hidden jewel of sorts,” Buckley explained. The reputation of the city precedes itself, as those who live in neighboring areas tend to think of crime rather than historical landmarks when thinking about or discussing the city. According to Andrew Portnoy, a Mountain Lakes resident, Paterson is mostly spoken of to describe the decaying areas of New Jersey. “I’ve never had any reason to go to Paterson. The city is really the epitome of industrial wasteland,” he said. Another issue that is certainly having an effect on the park is its primitive state. As you drive around the city there are few signs directing you to the park. Once you do arrive, there is only one small parking lot directly across from the Visitor Center. Although the park provides ranger-guided tours for those seeking background information on the park, it is apparent that this historical landmark is not yet living up to its full potential. There are few activities in which to participate once at the park. Unlike other national parks, many of which are large in size and lend themselves to hiking, kayaking and other activities, Paterson Great Falls is relatively small and within an urban setting. The site provides visitors with a Mill Mile walking tour and tables in a picnic area, but nothing else. 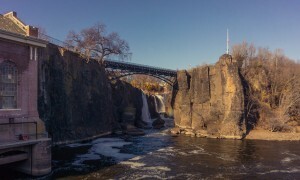 In its existing state, Paterson Great Falls is mostly an attraction for its aesthetic value and historical significance. Visitors to Paterson Great Falls National Historical Park pose for photos. Despite Paterson’s shoddy reputation, local officials continue to seek out avenues in hopes of improving the surrounding area and gaining greater recognition for the park. In recent years the park has taken on plans to improve its landscape and develop new attractions. Over the summer of 2015, improvements to the area on the north side of the park owned by the city known as Mary Ellen Kramer Park were completed after two years of reconstruction. Nearly $2 million were spent to upgrade walking paths, landscaping and the rehabilitation of a wall that allows visitors to get closer to the waterfall. Plans for a new amphitheater directly across from Mary Ellen Kramer Park have also been put into place, paid for with federal and county funds. Having the waterfall in the background of the new structure will surely be an attraction to those hoping to host an event there. This area of the park has previously been used for community events such as concerts in the past, leading to a seamless transition once the amphitheater’s construction is complete. Residents of the area are in favor of the recent developments, as they hope the economic impact will be felt throughout the city. “It is great to see what initially built this city is still attempting to have a positive impact on the community,” said Paterson native Miguel Cruz. Further developments continue to come to fruition as nearly $3 million of state and federal funding has been allocated to the creation of a river walk and plaza. The walk will be open to the public and serve as another medium to view the falls from a different perspective. Although Paterson Great Falls is not yet a fully developed park with a wide range of activities in which to participate; it is still in its infancy. It is apparent after seeing all the new plans put into place that the city and park service are determined to continue developing and improving the areas surrounding the park. With this continued development one can hope that the promotion of the Paterson Great Falls can further help the reconstruction of a once great city. The park is open to the public 24 hours a day, seven days a week. The park does not charge an entrance fee. As a new national park, Paterson Great Falls is in the process of developing tours and other programs. As of now, it offers only an introductory tour, however a self-guided walking tour is available to be downloaded as an app. The Great Falls Welcome Center is open Mondays – Sundays from 10 a.m. to 4 p.m. It is located on 72 McBride Ave., Paterson, N.J. For more information, call 973-523-0370. At the Visitor Center, additional information about the City of Paterson and memorabilia relating to the city is available. Park rangers are available to answer any further questions you may have about the park. Take exit 155P to Route 19 North. Go two miles and take I-80 West/Grand Street exit. Stay to the right for Grand Street exit ramp. Turn left at light onto Grand. At second light on Grand turn right onto Spruce Street. At second light on Spruce bear right onto McBride Avenue Extension, then make immediate left into Great Falls Overlook parking area. Take Exit 159 (Saddlebrook) onto I-80 West. Follow the I-80 West directions below. Take Exit 57 B-A. Follow the Downtown Paterson signs. Turn left at second light onto Cianci Street, and left at first light onto Market Street for one-quarter mile. Turn right onto Spruce. Go one block and turn right onto McBride Avenue Extension, then immediately left into Great Falls Overlook parking area. Take Exit 57 B, circle onto Grand Street exit. At end of exit ramp turn left onto Grand. At second light on Grand turn right onto Spruce Street. At second light on Spruce bear right onto McBride Avenue Extension, then turn immediately left into the Great Falls Overlook parking area. Head northeast toward I-80 east. Continue on I-80 east. Take NJ-19 north to Cianci Street, for two minutes (1.7 miles) . Merge onto I-80 east (0.9 miles). Take exit 57B toward downtown Paterson (0.2 miles). Merge onto NJ-19 north (0.6 miles). Drive to McBride Avenue, two minutes (0.5 miles). Turn left onto Cianci Street (495 feet). Turn left onto Market Street (0.1 miles).Turn right onto Mill Street (0.1 miles). Turn left onto McBride Avenue. The park will be on the right (0.2 miles), 72 McBride Avenue, Paterson, N.J. 07501. Head north on From Road (344 feet) ,Turn right onto the ramp to Parkway Entrance south, toll road (0.3 miles). Merge onto Garden State Parkway, partial toll road (4.1 miles), Take exit 159 to merge onto I-80 west (5.0 miles), take exit 56 for Squirrelwood Road toward West Paterson/Paterson (0.1 miles), turn left onto Squirrelwood Road (0.3 miles), Squirrelwood Road.